Indie 184 is a powerhouse graffiti artist, street artist, and painter, that I’ve been obsessed with since forever. 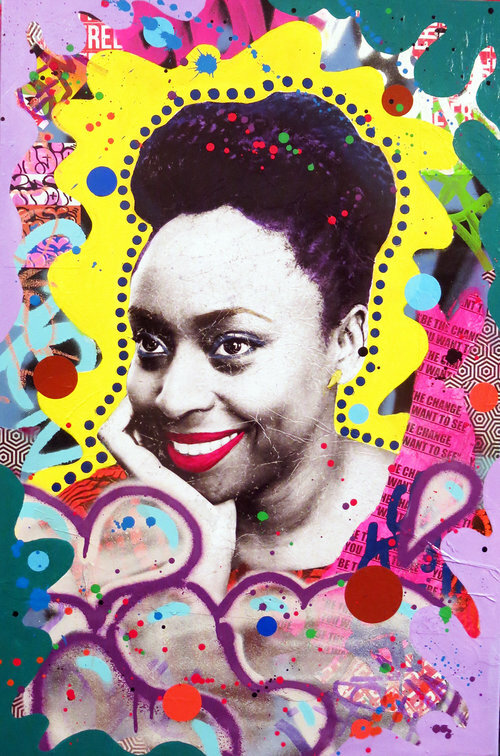 Her murals on the LES would send me in spirals, everything about her aesthetic is fire, her colors, the strong iconic women, and her bomb feminist messaging. This year is off to strong start for the Latinx native New Yorker, she was tapped as Rimmel London’s new Chief Artistic Officer, has a new clothing collab with iBlues, and a slew of exhibits lined up. Gallery Gurls: Congrats on your amazing new role at Rimmel London. Your uber femme aesthetic is such a perfect fit with the brand. How did this collab come about? Indie 184: Thanks so much, I feel so blessed and honored that they considered my work. The collaboration came out of the magical energy of the universe. I put my intention out there and boom the universe delivered. I always wanted to work with a cosmetics brand that would allow me full creative freedom. 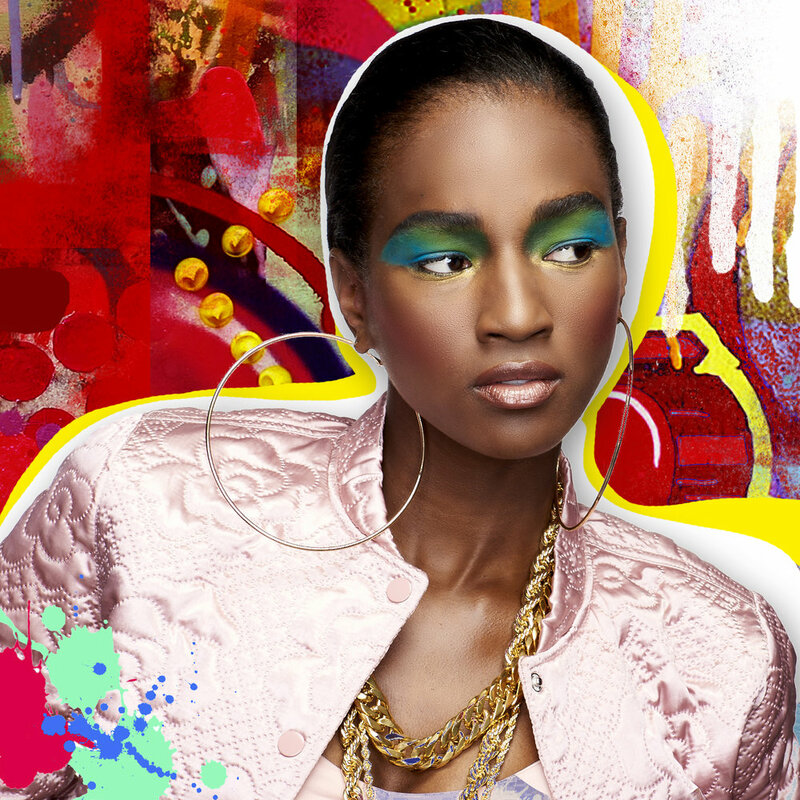 Rimmel London is the perfect fit with its rebellious and fearless style that reflects the message of my work. It speaks volumes that they actually partnered up with me, so many companies just feel like street art and graffiti is up for grabs at the artist's expense. 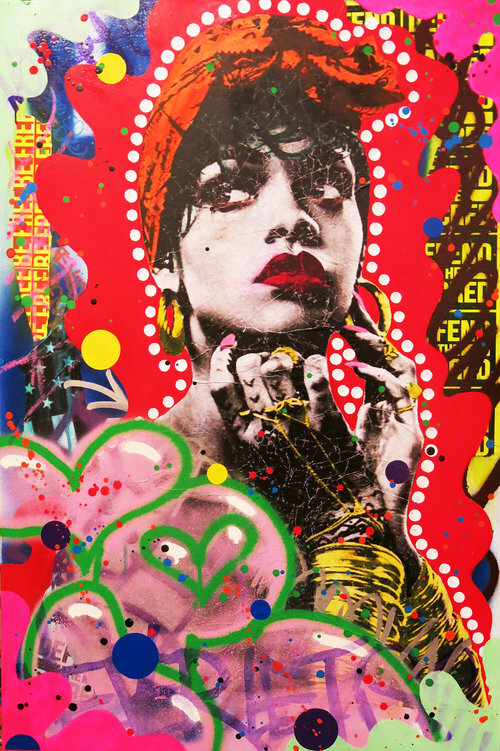 "Rimmel London is the perfect fit with its rebellious and fearless style that reflects the message of my work. It speaks volumes that they actually partnered up with me, so many companies just feel like street art and graffiti is up for grabs at the artist's expense." What have you loved most about working with Rimmel London? I love how open-minded Rimmel London is, they're not afraid to take risks with their innovative products and beauty aesthetics. The very first red lipstick and foundation I bought back in the days was Rimmel London. The quality of the products is outstanding at a budget friendly price. I love how they connect and celebrate the art of beauty. The artist with the Rimmel London creative team. Courtesy of Rimmel London. 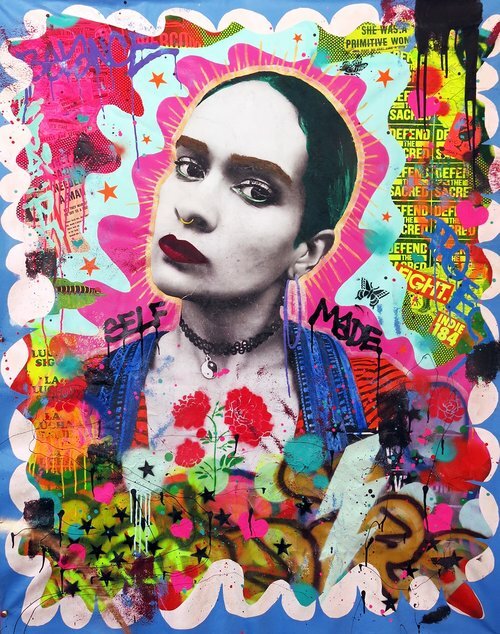 Your paintings are a mix of pop culture, feminism, and street culture with a big focus on female icons. Can you talk about that? The origin of the femininity in my work is being raised by a single mom of four in NYC. I identified that being a woman meant to have power and I love to honor that in my paintings. When I first started making art, it was with film photography and stencils. Later on, I would teach myself graphic design and be introduced into the graffiti culture. So naturally this mixed-media style of painting was born. Can you expand on your grafitti roots? When did it start and how did you start your mural-making? I grew up all over NYC, every grade was a different school and neighborhood, so I was exposed to the “street museum” at a young age. At age 11, I went to the public library and discovered the graffiti bibles that are “Subway Art” and”Spray Can Art” books. It was life changing, I wanted to be like the glorious graffiti writers of the 80s, so I would copy the pieces and characters I saw in the book. But it wasn’t until a decade later where I would evolve from a spectator to actively participate in the culture. Graffiti is a sort of secret society so it wasn’t until circa 2001 that I would meet graffiti writers to connect the dots to navigate and learn the skills I needed to get up. I started just tagging around and trying to find my identity and place in the culture, at the same time I became a mother, so i didn’t have the privilege of recklessness. Two years later my second child was born, my responsibility as a mother came first. So it was difficult for me to become a vandal, a requirement in graffiti for “street cred”. I would destroy the antiquated masculine philosophy and create my own trail to blaze. "I started just tagging around and trying to find my identity and place in the culture, at the same time I became a mother, so i didn’t have the privilege of recklessness." What is next for you in 2018? what are some new projects? Right now, I am painting away in the studio creating twenty new works for my solo show Eutopia at 212 Arts opening May 3rd in New York. Embarking on a new series of paintings, releasing the past (people, places and things) has been challenging but very necessary to evolve. I am rebuilding myself a new chapter that has inspired me to create my new collection of paintings. My capsule clothing collection with iBlues “Indie’s Wall” was recently released internationally, which features a variety dresses, pants, jackets, blouses and sneakers. I’m happy with the result and quality of the clothing and campaign, as we worked for almost one year creating the collection. Other projects are in development and there are usually some wonderful surprises throughout the year, so I just go with the flow see what comes into fruition. What I do want to achieve this year is painting more murals and graffiti pieces in the street. I can absolutely relate to intersectional feminism, there are many complexities to feminism. However, it also gives further division to the purpose and definition of what feminism truly is. Equally for all gender, races, classes, etc.. At the end of the day, I do not want to be categorized into a theory or be chastised by a label. I just want to create empowering art and share with the world as a human being. "I would destroy the antiquated masculine philosophy and create my own trail to blaze."